While the likes of Theo Walcott, Per Mertesacker, Gabriel, Francis Coquelin and even Jack Wilshere - just a couple of weeks after England's exit from Euro 2016 - have reported back to London Colney, Wenger is determined to afford extra holiday to those who have endured a busy summer schedule. 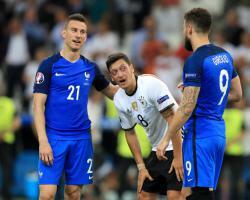 Wales midfielder Aaron Ramsey, German playmaker Mesut Ozil and French duo Olivier Giroud and Laurent Koscielny have all been granted an additional break following a draining European Championship campaign. "You consider the rest time because France had a long, long go and I believe that they need four weeks' holiday because they need to recover from that," Wenger told Arsenal Player. "It takes you two or three weeks to regenerate..
That disappointment to lose a final, it takes some time to recover from that. Of course, in the longer term you benefit from that."